The Sacramento Taco Party is a one night charity taco cook-off and tasting event. 15+ Sacramento area restaurants will be using the freshest ingredients in our farm to fork region as they cook up their best tacos during a competition for votes from you and our panel of judges. Attendees get to enjoy live music while sampling the area’s best restaurant tacos. We’ll also have tastings of local craft beer, cider and a margarita competition. All proceeds from the event will be donated to the Food Literacy Center. Thank you for your interest in our Sacramento Taco Party fundraiser. There is so much interest for this event, yet due to the number of competing food events at this time, the October 11th event at Cesar Chavez Plaza has been cancelled. We will be refunding your ticket and processing fees in the next few days. We originally intended this event to be a benefit for our charity partner, Food Literacy Center. Yet, because they're a small nonprofit with only six staff, the scale of this event would have taken them away from their core mission: teaching cooking and nutrition to kids in low-income schools. But wait! Sacramento Taco Party is moving online and into our region's best taco restaurants! We're throwing the kind of taco party that has no limits! We're inviting everyone to visit taco party restaurants, eat their tacos, and vote online for their favorite between now and Taco Tuesday, October 11! Our goal for this event was to showcase the amazing food in our region while raising money for an important cause. We sincerely hope you’ll make a $20 donation to Food Literacy Center so they can teach kids to cook their own tacos! The first 75 people to make a donation of $25 or more will receive one of our VOTE TACOS yard signs. You’ll need to bring your donation receipt to the Food Literacy Center headquarters during business hours to claim your sign. We’re also encouraging everyone to share a taco picture on Instagram or Twitter with the #sacramentotacoparty hashtag. 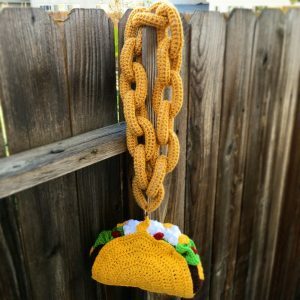 One randomly selected lucky person will win this epic hand knitted phat gold taco chain and a gift card from one of our participating taco restaurants. Thank you for being enthusiastic about our event! 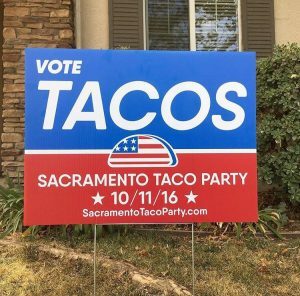 We cannot taco 'bout how supportive Sacramento taco fans have been! Check your email and our Facebook page for more upcoming virtual taco party details!